Sadly, our monthly recipe card club fizzled out after Hurricane Ike soaked most of the members. But, I still like making them. 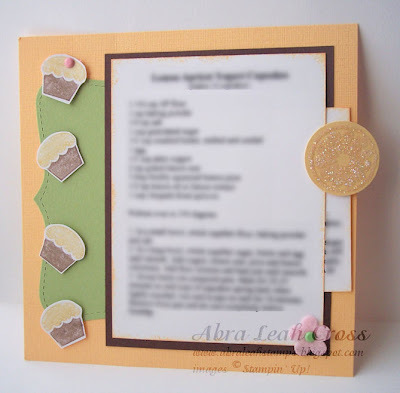 If anyone is interested in joining a recipe card swap club, let me know! I'd be willing to get the club up and running. Chloe will be five (5!) June 30th and she has been saying for months that she wants a fairy princess party. I couldn't find a fairy princess stamp, though. 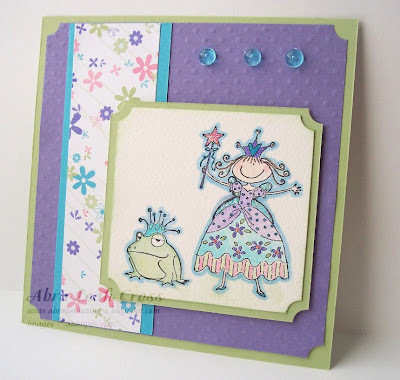 Plenty of princesses and a lot of fairies... So, I had to make my own. I used Dazzling Diamonds on her wings, wand, and crown. I think she turned out pretty cute. Now I've got to work out the wording for the back. Seriously - I hope Chloe actually dances today in her recital! It will be her 3rd recital - the first one was when she was 2, and she just walked off the stage without doing a thing. Last year she danced, though, and I hope she will have fun and do well. 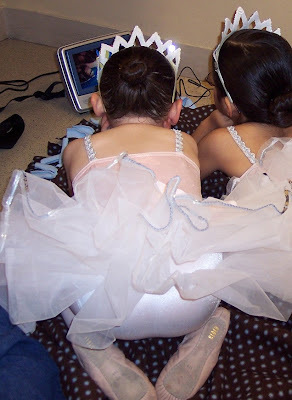 Here she is backstage during dress rehearsal on Thursday - I brought our portable DVD players so that the kids would have something to do between dances. Her group had one tap and one ballet routine. And here she is waiting backstage before her tap routine. Bradley loves to go fishing. 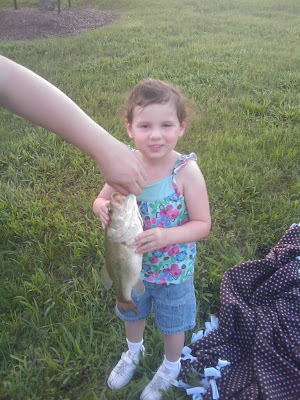 We took the kids fishing for the first time last October and they had a blast. Since then Bradley asks to go several times a week, but we just haven't had the time. Today my brother, Matt, and Mike decided to take the kids out for a couple of hours of fishing fun. Within the first 10 minutes of casting off, Chloe saw a splash and then her pole got "heavy." The guys had to help her reel it in - but she pulled it up out of the water herself. My brother got it off the hook and Chloe tried to hold it, but it was too wiggly. She told me, "I pet him and he wagged his tail." Mike let him go and he swam quickly away from Chloe, who wanted to keep him in a bowl. Today we celebrated Mother's Day a bit early - I made a huge tostada bar dinner and my mom came over with my sister's kiddos. 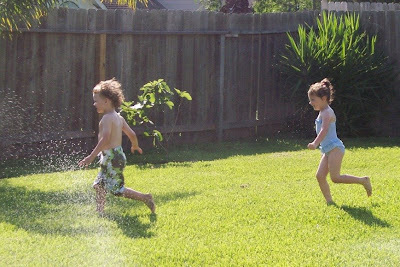 The kids ran around in the sprinklers for about 40 minutes and had a blast. Poor Chloe only had this suit from last year which barely covered her chachas. And Bradley's trunks were actually too big - I had bought them at the end of the season thinking he would grow into them by this year. We'll have to go shopping soon because the neighborhood pools are open now and they are dying to go swimming. I can't wait for summer break!! Bradley asks ALL the time what things are made out of; he's incredibly curious. Bradley: Mommy, what are monkeys made out of? Me: What are YOU made out of? Yum!! 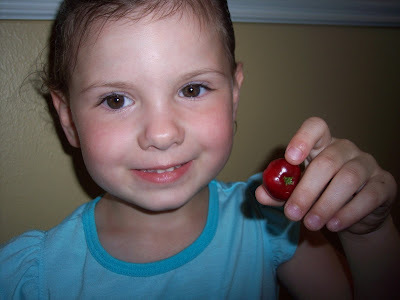 We have a little cherry tree that is covered in green cherries - but this is the first ripe one of the year. Chloe and I shared it and it was deliciously sweet and tangy. I can't wait to make cherry pie! 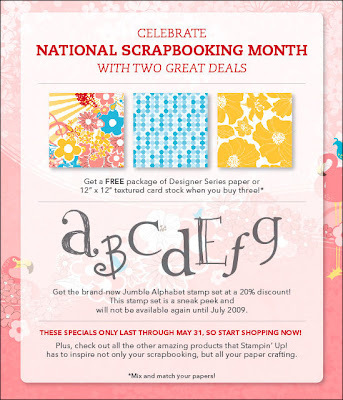 Visit my website HERE for some really fun specials for National Scrapbooking Month!